Considering a Conquest Class C Motor Home? 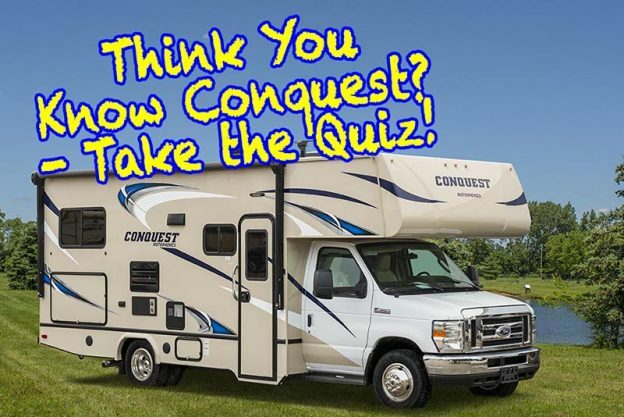 Take the Conquest Product Knowledge Quiz! Knowledge is power, especially when you’re considering a major purchase like a Class C motor home. With so many competing brands and models, it’s essential to have the facts you need to make a smart decision. We’ve used the Conquest Product Knowledge Quiz to help train the salespeople at Gulf Stream Coach Dealerships across the U.S. and Canada – Now YOU can see the questions and answers that separate the Conquest Class C from every other motor home on the market. If you’ve done your research you already know that the Conquest Class C has a host of features you won’t find in any other motor home on the market today. And you probably know that Gulf Stream Coach has assembled over 35 years of experience, technological advancement, and customer input to create the ideal Class C.
But what specifically makes the Conquest Class C different, better, and unique? What do we build into the Conquest to set the industry standard for construction, comfort, and convenience? What features will you miss if you buy ANY OTHER Class C? Take the Conquest Product Knowledge Quiz and find out! What’s that? You need to study a bit more before you face the test? Here are links that can help you score 100%. Our Conquest Class C color brochure – Full of features and options no competitor can match. Think you’re ready? Don’t worry – No one ever fails the Conquest Product Knowledge Quiz! It’s just a fun, challenging way to learn that the Conquest Class C is the ultimate expression of Gulf Stream Coach ‘Quality, Value, and Innovation.’ It’s also a great way to have confidence that you’re making the right choice. Just click here to take the Quiz! This entry was posted in News on April 11, 2018 by pcampbell@gulfstreamcoach.com.